Transforms into crows that fly freely to far away places. Sacred places everywhere are surrounded by flocks of ravens. Fire pujas and vase offerings are often blessed with thy following. Four-arm Mahakala is the principal protector of Great Pleasure Heruka. Crows are his transformations. Once in a dream I saw a flock of crows transformed into human protectors armed with weapons. Years ago when I went on pilgrimage to Buddhist sacred places in India, Nepal and Japan, all the sacred places were surrounded by flocks of ravens. For about two decades now, each time when we went on the Dharma activities of fire pujas or vase offerings, often crows would come, and we are used to offering them some food. Now with respect and gratitude this praise is composed to express my admiration. 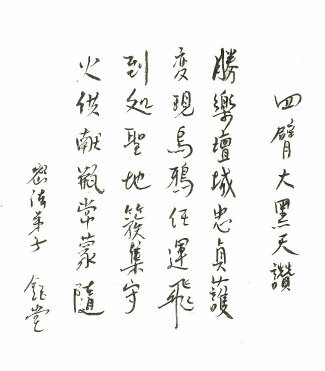 The original Chinese version seemed to be blessed by this protector because the concluding word of each sentence all happened to be a verb, just as if indicating that all four arms are swinging in action.